This tab is available if the expert options have been activated. Here, indexes for database fields can be defined, which will improve performance when filtering or sorting tables in applications. 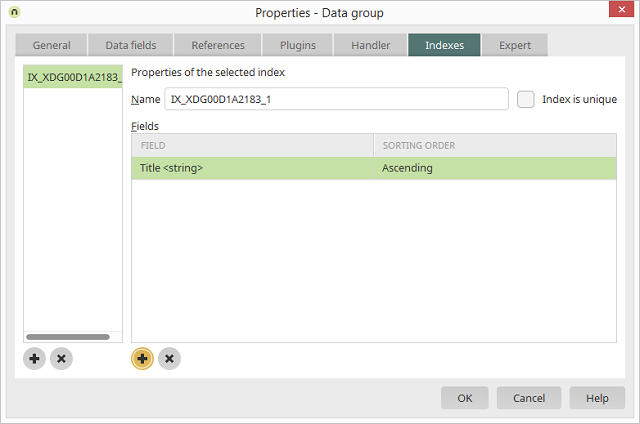 If the data group contains foreign keys or references, indexes will already have been created here - one index for all primary keys and one index per reference. These indexes cannot be edited via this dialog or changed - apart from the index names. If a reference from the data group is deleted, the corresponding index is deleted automatically. You can find a list of all defined indexes in the left area of the dialog. Creates a new index. The name of the index will be generated automatically from the name of the current data group and an incremental number. Resets an existing index. The index will be removed from the list. The index name of the currently selected index is shown here and can be edited. If the field (or fields) in the "Fields" column contains unique values, the "Index is unique" setting can be selected to improve the performance when filtering or sorting. List of fields that are selected for the index. For each field you can define whether the index should be in ascending or descending order. The desired field can be selected from the shown drop-down list. The currently selected field is removed from the list.